Family game night took on a new meaning when the brothers McElroy and their father began playing Dungeons and Dragons for the entertainment of all. Podcasting sensations Justin, Travis, Griffin, and their dad Clint have been playing the popular immersive RPG for over three years, and while many others can boast the same, they probably can’t say that they became the stars of their own graphic novel because of it! 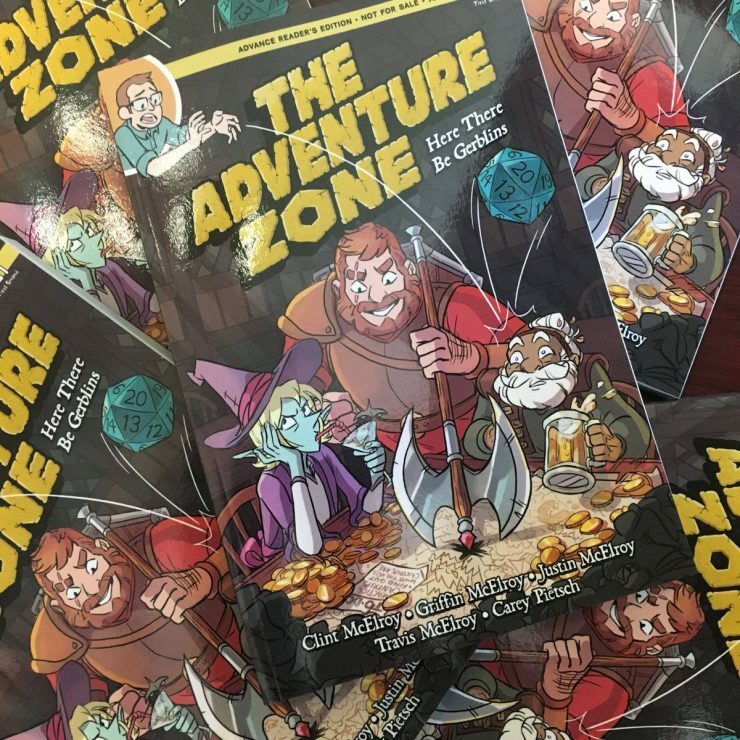 Last month, The Adventure Zone: Here There Be Gerblins became available for order on a variety of bookseller platforms as a full-color adaptation of the first arc in their wildly successful podcast, The Adventure Zone. With Carey Pietsch at the artistic wheel, this story comes alive as a vibrant retelling of a D&D campaign with three charming characters and their Dungeon Master, also known as the DM. That’s right, I said the DM is in the book! Griffin McElroy makes many appearances as a metagame interactive element, because the book is far more than a narrative version of a standard Dungeons and Dragons campaign. This graphic novel is actually more of an adaptation of a full-length podcast, featuring some interaction between the ‘characters’ and their unseen overlord, where the voices of the three men playing their muses come through in hilarious witticisms that really make this book a unique experience. Griffin’s fantastical pawns in a magical story full of mystery and personality are Merle Highchurch, the dwarf cleric played by his father Clint, Magnus Burnside, the human warrior played by his older brother Travis, and Taako, the elf wizard played by his oldest brother Justin. Each of the player characters adds a unique flavor and well-rounded dimension to the atmosphere of an otherwise pretty serious plot, featured in both the graphic novel and the full podcast, making it an experience that will have you laughing until there are tears in your eyes. The McElroys have been playing the podcast game for years, starting in 2010 with My Brother, My Brother, and Me, a comedy-advice show where they “take your questions and turn them, alchemy-like, into wisdom.” Having listened to each and every episode from the start, this writer is intimately familiar with the in-jokes and out-segments of this twisted Dear Abby. MBMBaM covers a span of eight years, from 2010 to the present. Pop culture is a focus, but so is everything else- from ghosts, to horses, to Jimmy Buffet’s Margaritaville. Listening to the podcast is a hilarious adventure that has hints of real-world application in it, and as you listen, you’ll find personal information about the brothers and their lives sprinkled throughout. By the time you burn through over 400 episodes, you listen to them react to their brothers’ weddings and the births of their first little nieces and nephews between heaping helpings of their typical shenanigans. Along with these new life developments also came new podcasts. Each of the boys has participated in their own “spin-off” series that blasted to fame from MBMBaM. Travis and his wife Theresa have Schmanners, where they discuss the history and modern-day application of manners, from table etiquette to pizza and whether or not you should talk during a rideshare. They even take questions on their topics and answer them lightning-round style in comical ways. Justin and his wife Dr. Sydney cohost a medical history podcast called Sawbones, in which they go over a fascinating history of misguided medicine and why humanity tried the crazy things they did to cure headaches or ease restlessness. The Sawbones podcast recently even had its first book published, under the same name, following The Adventure Zone’s book release! 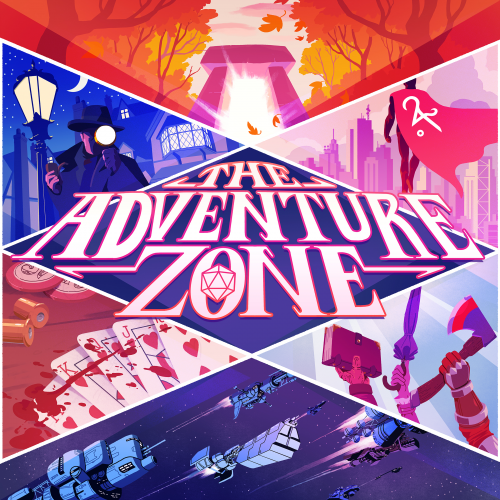 While their claim to fame will always be My Brother, My Brother, and Me as a starting point, it wasn’t until The Adventure Zone that the boys and their father could say that a book had been developed in their honor. It’s amazing to see podcasts, a traditionally geeky form of media, becoming so beloved with avid listeners around the globe- and I think we have, at least incrementally, the brothers to thank for that! With a book like this, fans can now see how geek interest and gaming podcasts are beginning to transcend their audio formats into prose (like Sawbones and Welcome to Nightvale) and comics (The Adventure Zone, and Critical Role, another popular Dungeons and Dragons series). The Adventure Zone: Here There Be Gerblins is available for order now through book retailers, and even your local comic store. If you struggle to listen to lengthy podcasts, are unsure if you’d enjoy listening to four goofballs playing D&D, or just love these boys and their banter, put down the dice and consider picking up a copy!